Meat is often a big portion of our weekly grocery budget and finding a coupon for it is very rare. We normally have some type of meat for dinner so finding a way to cut down on the cost can be very beneficial to the household budget. Here are 7 ways to save money on meat that will help your family to eat well and use your money elsewhere! 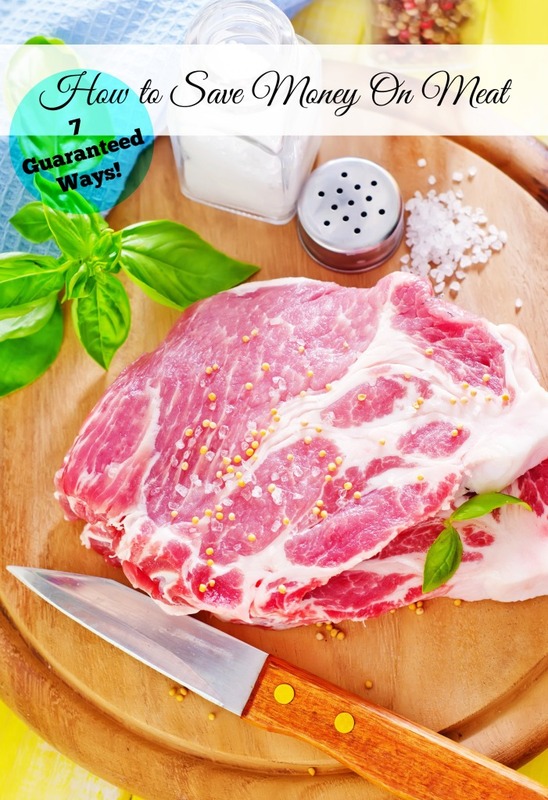 7 ways to save money on meat! So just how does a person/family save money on meat without giving up on quality? Take advantage of these sales and buy in large quantities to take home and divide up and use for meal planning for the next 6-12 months. Always make sure you package your meat correctly when freezing. It’s not going to save you anything if it gets freezer burned and you have to throw it out. 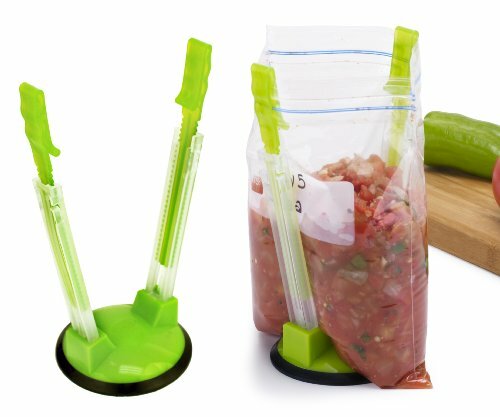 I found these super cool freezer bag holders that are helpful for getting my packaging done very quickly! Buy Less Expensive cuts of meat. We often do a lot of crock pot cooking in our house especially in the summer when it’s hot outside and we are trying not to turn the oven on. You can often get fattier meat for a cheaper price and this actually cooks up better in the crock pot. Are you grilling out tonight but can’t afford a pricey steak? You can grab a cheaper steak and use marinades and meat tenderizer on it to make it almost just as good as a great big t-bone steak! Grind or cut your own meat. I often use this option when buying pork. You can grab a loin or two and slice it up yourself and save a ton of money doing it. A meat slicer is helpful but we just use an old fashioned cutting board and sharp knife to slice ours and have never had a problem. Most Americans tend to eat more meat than is recommended. I don’t know one person who wouldn’t love to have a giant 10 oz. rib-eye cooked on the grill piled high with a big dose of sautéed onions but really do we need that much? One serving of meat is 3 oz. (which is about the size of a deck of cards) and if you keep your servings down to this size when meal planning you will save yourself a bundle. Ask your store about discount meats. If you shop at your local grocery store, get to know the butchers. They can give you a heads up on when meats get marked down and you can purchase good quality hamburger for half the price of their cheap ground beef just because it was not ground up that day. The store offers it as “fresh today” and if they do not get it sold it is often deeply discounted. I usually find these great deals on Tuesday, Wednesday or Thursdays (when stores are a little slower). Keep your eye peeled for items that are marked for quick sale. Meat like anything else has an expiration date. This does not mean that the meat will automatically go bad when that date hits. It just means that the store cannot sell it to you after that date. They often deeply discount items that are coming close to the magic number and this can mean huge savings for you. Just make sure that you either use it soon after you buy it or get it into the freezer for use at a later date. This goes without saying, but just in case..don’t buy meat that looks yucky! Say WHAT??!! I know it is a scary thought but there are plenty of ways to get protein in your daily diet than by meat alone. Make yourself a nice healthy salad piled high with garbanzo beans and eggs and you just might find that it’s really not that bad. Did you know that rice and beans make a perfect protein? Yep, when paired together! If you are a meat lover..what are your helpful hints on how to save money on meat? Whole Foods sometimes has a $4.99 ground meat sale which is awesome and when they do, I definitely STOCK UP! I know! It’s crazy isn’t it?! Thank you for stopping by..blessings to you! I really like your ideas they are some things that we do at our house already. We have two days a week that we go meat free in our meals to help cut costs. We really don’t even notice that we do it. Good ideas! Thanks so sharing! Thank you Kelsey! Yes I think meatless meal cut back significantly and really it’s barely noticeable as you say. Thank you so much for stopping by!